One of many videos uploaded to youtube and social media depicts Ansar al Ummah “rebels” firing mortars, claiming responsibility for the mortars that were intended for the Parliament building. It’s mortars like these which are hitting all over Damascus, hitting areas where masses of civilians are sitting, walking, living. Sunday and Monday saw a total of 27 civilians killed in the Damascus region. (Including the mortar which hit the Bab Touma square, killing 2 and injuring at least 23, according to Sana news. Mortars also hit Hamra street, Salhia, Arnous). Three of the dead were a man, his nearly 2 year old daughter and his wife’s younger brother, an 11 year old. Two days ago, one of the stream of mortars being fired upon various areas of Damascus hit Bab Touma (Thomas Gate) square, killing 2 and injuring at least 23, according to Sana news. 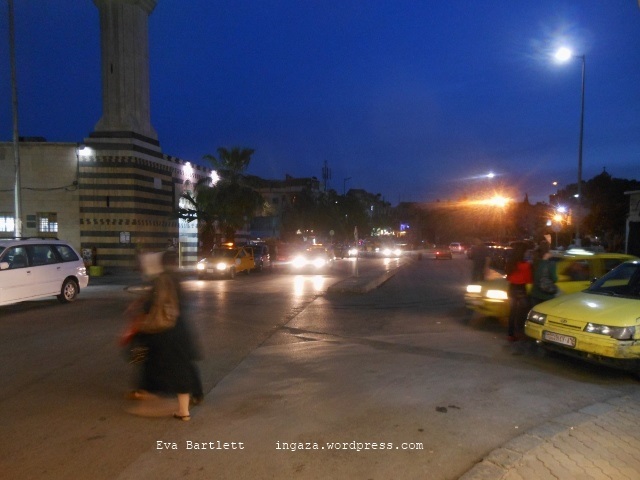 Bab Touma itself is one of the eight gates leading into Damascus’ Old City. It also happens to be a busy area, filled with market stalls, vendors, pedestrians, and shops. And in terms of the greater area, while I haven’t been hurt by the mortars, I’ve heard many in the old city in the past few days, and many have landed within 500 metres or less (20-30 metres) of places I’m staying or have been in Damascus. 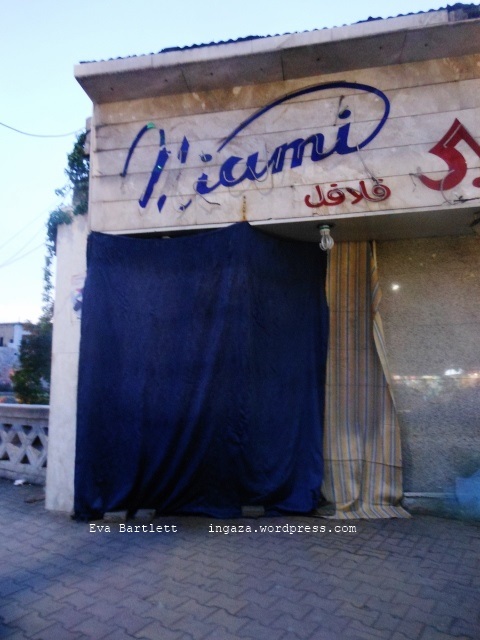 A falafel shop was damaged in this latest Bab Touma mortar attack, and many shops surrounding the open area where the shell landed were damaged to varying degrees. 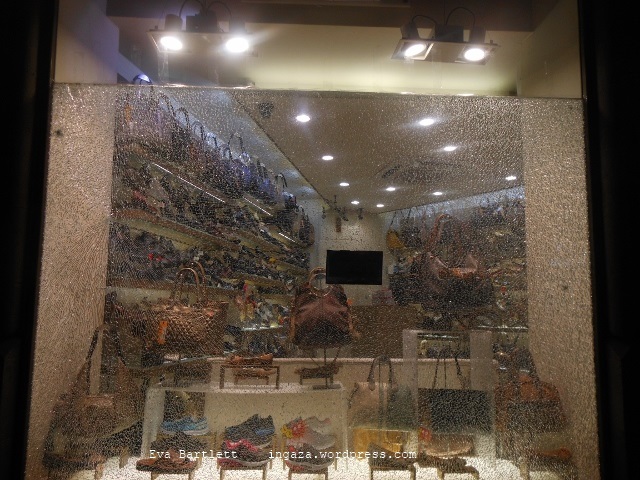 A shoe store I visited last night in the area wasn’t too badly damaged; the windows had their original layer of thin plastic on them, which kept the closest window from spraying glass into the room where employees were working. I chatted with the owner, an Armenian, about the attack. He wasn’t there at the time, but an employee was. Across the street, a clothes shop employee pretty much reiterated what I’d just been told. “This isn’t a revolution,” the first man said. “They’ve come from outside. Do you know how we were living? We had security, work… but, sorry, now…? A juice vendor who gave me a glass of freshly pressed orange and grapefruit juice some nights ago waved me over to say hello as I walked back to my hotel. Sitting outside his small booth, he lamented the Syria of more than three years ago. “This area would be alive until 5 am,” he said, gesturing to “Straight Street” leading from Bab Sharqi (East Gate) to the Hamdiyeh market and on. “There was live music in the hadika there,” he said, pointing to a long grassy patch flanked by the remains of Roman columns. “Tourists came, they loved it. Now, no tourists. You could walk home or go out in the late hours of night, without fear of mortar attacks or being kidnapped,” he said, echoing what so many have told me.